Michele A. Utley-Voigt from California lives and work between Connecticut and New York City. Michele studied at The Otis Art Institute of Parsons School of Design, Los Angeles, CA, at Parsons School of Design, Paris, France, has a Bachelor in Pre Law/Political Science, California State University, Los Angeles, CA and in Women’s History at Glendale College. Through complex layers of images, Michele examines, embraces and extract humanity’s inner magnificence. One of her celebrated paintings has a woman soaring, rising, flying, frolicking and ascending at any stage or event in her life, or in another Artwork that is round as our World, its characters call to goodness, kindness, and beauty to exalt the real best side of human nature, the respect with which a child must be treated, stopping bullying, harassing or cruelty. Recently Michele has added bright colors to her paintings that vividly outstand as a Geometric complement to her unique works. Widely exhibited, collected and awarded in USA and abroad, Michele was recently represented by Contemporary Art Projects USA, in 2017 at Art Santa Fe, NM, in the group show Variations on the same Subjects: People, Nature, and Geometry at the Art Gallery in the ArtsPark of Hollywood, FL, and at Red Dot during Art Basel Miami week. In 2017 and 2018, at Art Palm Beach and Art Boca Raton, both in Florida and in the 2018 Pre-Art Basel Miami Week Exhibition: “ART from Our Earth, the Sea and the Sky” Art Gallery in the ArtsPark of Hollywood, FL. Michele also participated with her exquisite paintings at Scope New York and Scope Miami 2018. 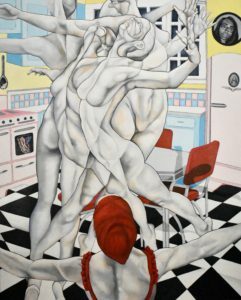 At Art Wynwood 2019, Contemporary Art Projects USA introduces a colorful painting by Michele A. Utley-Voigt that portrays the human experience and soul of life, depicted by figures interacting within a realm of time, to embrace humanity’s inner magnificence in a call to goodness, kindness and beauty, to exalt the real best side of human nature.